Social media is inherently a system of peer evaluation and is changing the way scholars disseminate their research, raising questions about the way we evaluate aca demic authority. Continuing with our focus on the merits of social media for making academic impact, Alfred Hermida, award-winning online news pioneer, digital media scholar and journalism educator, argues that social media is inherently a system of peer evaluation, where participation and engagement are recognised and rewarded through dynamic social interactions. Harzing’s Publish or Perish is the prevailing mantra in universities, with academic authority derived from a solid publication record in peer-reviewed journals. It is a tried and tested approach to evaluate scholars, which has changed little despite the advent of networked, digital communication technologies commonly referred to as social media. Arguably, social media is inherently a system of peer evaluation, where participation and engagement are recognised and rewarded through dynamic social interactions. In a recent presentation at the Toronto WorldViews conference on higher education and the media, I explored the implications of social media for evaluating academic authority. Leading scholars such as Mitchell Stephens and Jane Singer have raised questions about how we assign academic authority, in essays published in Journalism Studies in 2008. They considered how the participatory and networked capabilities of new media could be applied to the scholarly world. They did not suggest abandoning the traditional academic peer-review process, and neither am I. Rather, we need to consider the implications of these networked, open and distributed technologies, and associated social practices, on teaching, research and service. 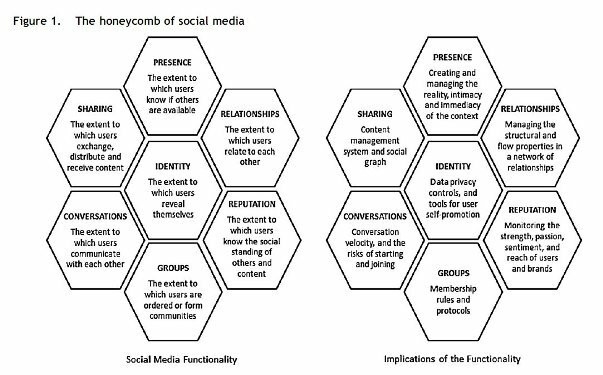 The building blocks of social media, outlined by Kietzmann, Hermkens, McCarthy and Silvestre in a recent paper (PDF) offer a good starting point (see Figure 1). By looking at five of these building blocks – identity, conversations, sharing, relationships, reputation – we can start to create a framework to assess the impact of social media activities. Identity in social media goes beyond the biographical details on a profile. It is also constructed by the messages sent and received. Communication with others plays a role in shaping identity on social media. These conversations involve exchanges with multiple audiences, from students to scholars to members of the public. On Twitter, for instance, how a message spread on the network can be tracked and measured as the exchanges are taking place in public on a digital network where data is archived, searchable and retrievable. Tools such as SocialMention.com seek to analyse exchanges as a way of quantifying influence on social media. Sharing is a key element of social media. There is an expectation that users will exchange, distribute and receive links to photos, videos and more. For scholars with a wide range of connections, social networks provide a way to promote and publicise research, potentially reach a wider audience than through traditional academic publishing. But there is an opportunity to build a profile as a valued and respected curator of content as sharing is a form of social currency. Relationships are at the core of social media, with most people having a range of associations. The multiplexity of connections often determines the what-and-how of information exchanges. These relationships can be an indication of the worth an individual brings to the network, as it is a constantly evolving system of peer evaluation. Identity, conversations, sharing and relationships are variables that help to identify the standing of others, including ourselves, in a social media setting. The challenge is the lack of a standard measure of reputation. Instead, there services such as Klout that provide one measure of authority, though how the result is devised remains a proprietary secret. Social media can be seen as a constantly shifting system of peer evaluation, where our standing is based on the value we bring to the network. How do we as scholars assign value to what we do on social media and how we do it? How it relates to more conventional and accepted measures such as publishing in peer-reviewed journals or speaking at conferences? My purpose here is to foster a discussion on how to assess our activities on social media in an academic setting where authority is largely based on peer-evaluated publications. Please leave your comments below, I look forward to your hearing your thoughts. Alfred Hermida is an award-winning online news pioneer, digital media scholar and journalism educator. He is an assistant professor at the Graduate School of Journalism at the University of British Columbia, Canada, and his research interests include digital journalism and social media. He is a co-author of Participatory Journalism: Guarding Open Gates at Online Newspapers. Hermida spent 16 years at BBC News and was a founding news editor of the BBC News website.